These custom printed Libra polyester drawstring cinch backpack makes a perfect promotional choice for schools, summer camps, retreats alike because it offers ahoy space for storage. This drawstring cinch backpack comes with a drawstring closure and offers large zippered pocket for storing cell phone keys, and other small items. This means students hitting their coaching centers, people hitting the gym and others can easily rely on this backpack for storing their valuables. 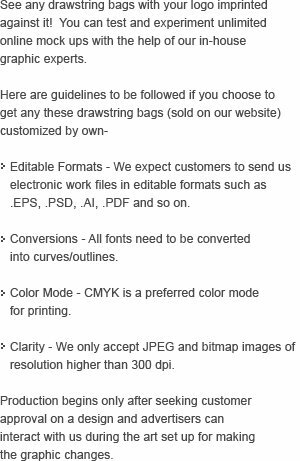 Request a quote to know price savings that you can expect to make by bulk ordering these promotional Libra polyester drawstring cinch backpack. Features- Made with 210 D polyester. Pull the drawstring rope closure to open the main compartment. Zippered front pocket. Reinforced bottom corner tabs. Item Size: 18" H x 13.5" W x 0" L.